Earlier this week, the official Twitter account for Burger King was hacked and turned into a McDonald’s feed. Now, the same thing has happened to @Jeep. The Jeep logo was replaced with a Cadillac logo and the hackers tweeted things like “We got sold to @Cadillac because we caught our employees doing these in the bathroom” with an image of a bottle of prescription-only pills. Jeep soon got control of the account and deleted the tweets tweeted by the hacker. For a brand, crises like these are of course serious, but handled correctly they can also become an opportunity. Often an account that is involved in a similar incident gains a lot of followers, thanks to the increased attention. 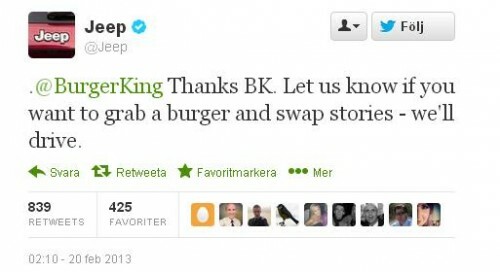 This time, both Burger King and Jeep turn the hacks into a PR opportunity by posting some clever tweets. Burger King seized the opportunity to send their wishes to a brand that was the victim of the same type of crisis, which showed a human side of the brand. Jeep cleverly responded with this tongue in cheek tweet. As you see, both tweets got loads of retweets and were marked as favourite by many followers. Also, note the dots before the Twitter handle, enabling all their followers to see the tweets, not only the ones that follow both accounts.